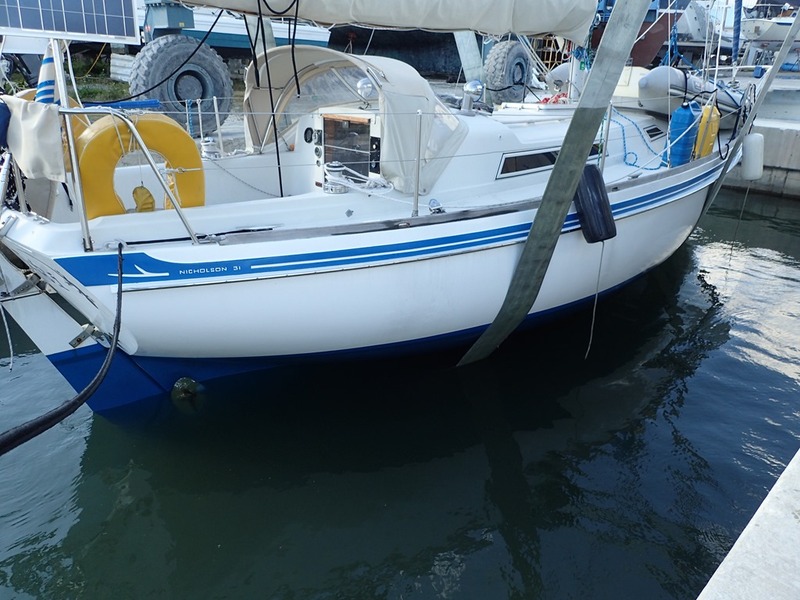 It started with the automatic bilge pump occasionally running. Means there is water in the bottom of the boat. Then running more often. 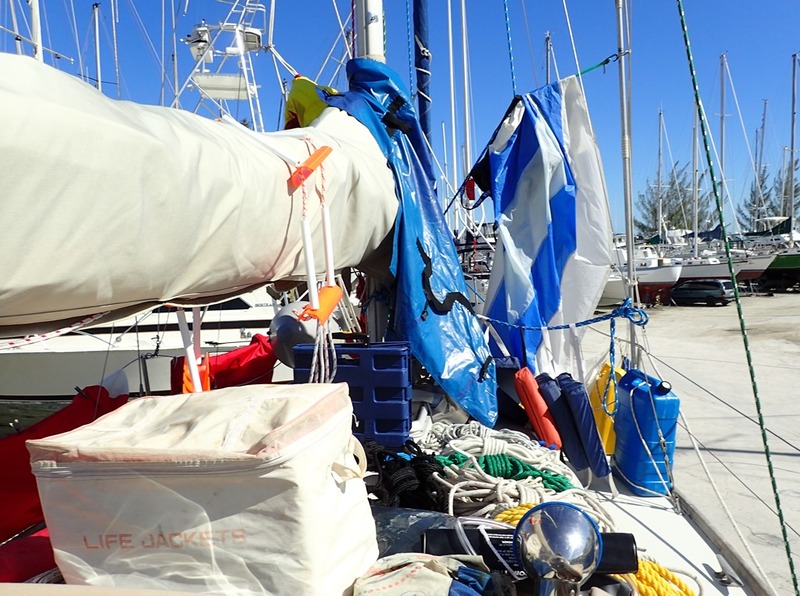 “Time to tighten the packing gland,” says Goldwin, the increased water entering the boat being his cue. 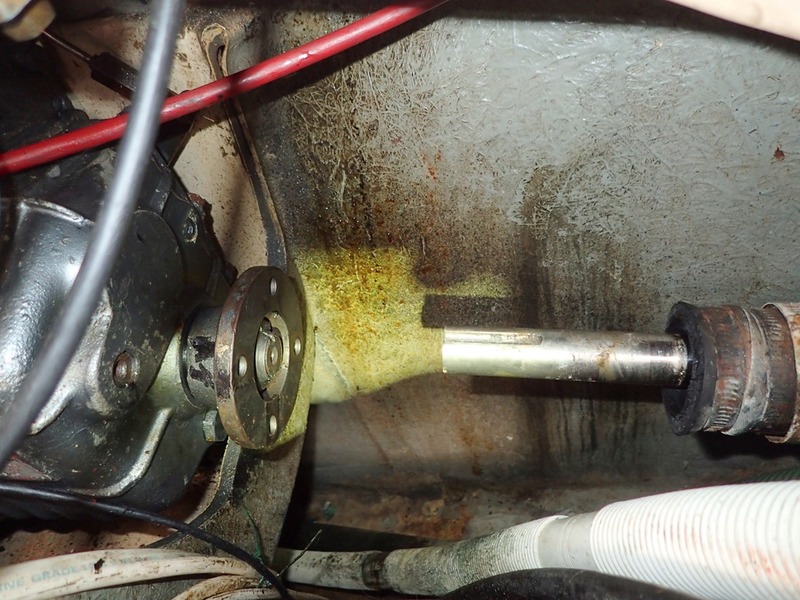 The packing gland, a/k/a stuffing box, prevents sea water from entering the boat at the point where the engine’s shaft exits the boat to the exterior prop. It’s basically a bronze assembly consisting of a sleeve that’s threaded on one end where a large nut can be adjusted to compress braided fiber that forms a ring inside, around the shaft, and basically seals it. When it starts to leak, you tighten the adjustment nut to further compress the donut of fiber, (a/k/a packing). A bit of a leak is expected, but when it increases, an adjustment is needed. Not a big deal, except that on Motu Iti, you have to take EVERYTHING, including the floor, out of the portside cockpit locker and crawl down to the bottom of the boat to access it. So Goldwin did that while we were in Vero on a mooring. While I was doing laundry on shore. While it poured rain over all the removed contents of the cockpit locker. But, oops, the adjustment nut wouldn’t adjust. Why not? Perhaps the nut was cross threaded? Not sure. Now what? Now what – is that we have to get the boat hauled. 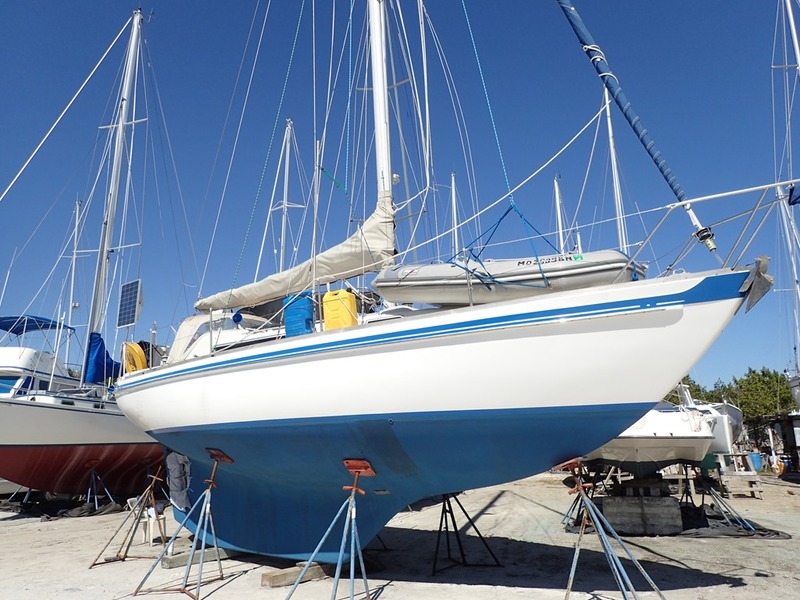 A quick review in Skipper Bob’s book of Marinas on the Intercoastal and google maps revealed a do-it-yourself marina just 15 miles south of Vero. Yes, they could haul us tomorrow afternoon (Tuesday). And yes, their entrance was 5 feet deep at low water – if we stayed on the south side. So next morning, off we went. The wind built behind us, 15-20 with higher gusts. But it was a sleigh ride for us. Until we turned into the entrance. The depth sounder alarm was blaring most of the way in, but it was high tide and we never touched. Into the service well and up she came. Looks easy here, but it took all afternoon. Here she is on the stands. We’re climbing up a ladder to our boat home again. Next morning, everything came out of the cockpit locker again. 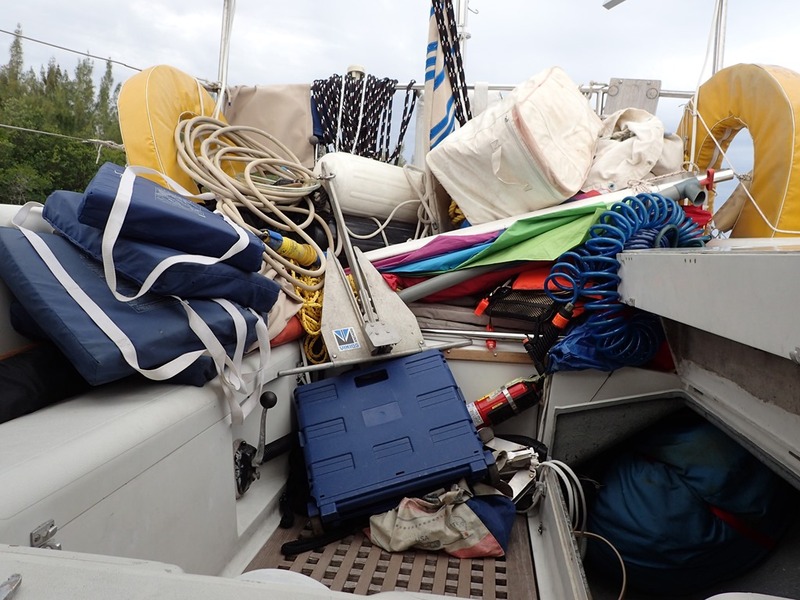 I hung it up all over the boat – did we look like a bunch of junk! But it all dried. 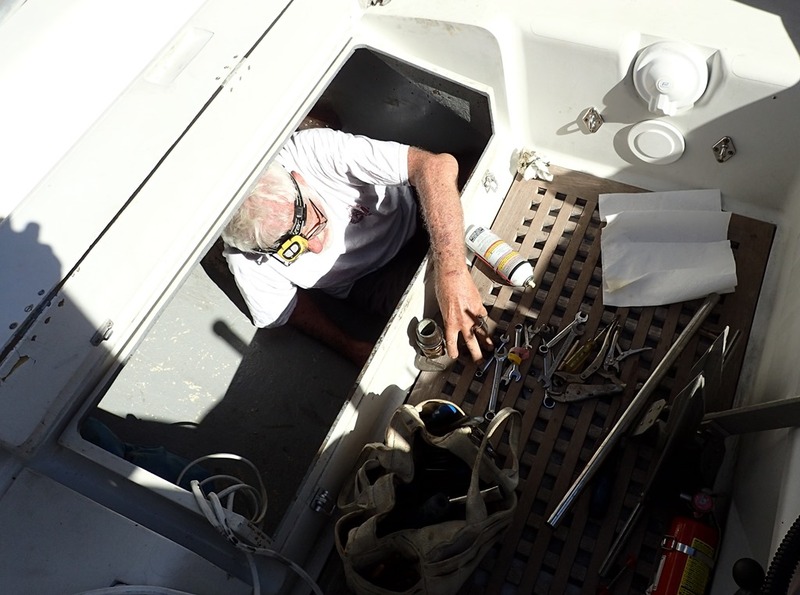 Meanwhile, Goldwin was buried in the bilge, working to remove the stuffing box. Luckily he can fix just about everything. 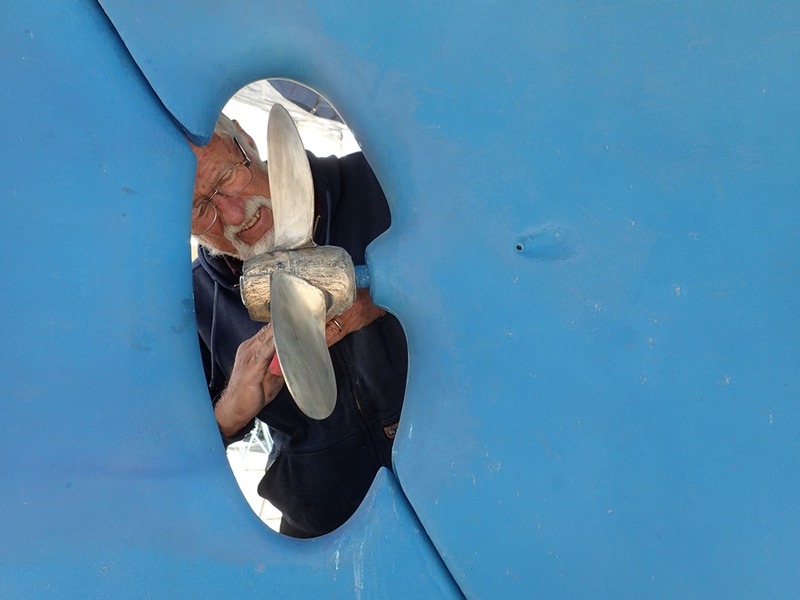 Hard to access the stuffing box, but the boat is designed so that the shaft and propeller can be pushed aft enough without hitting the rudder (so the rudder or propeller doesn’t have to be taken off), in order to remove the stuffing box. On the left is the coupling to the engine/transmission and on the right you can see the shaft that the packing gland goes over – pushed back from the engine for removal. When he finally got it out – hours later, the nut seemed just fine. Possibly a burr on the threads? So he put it all back together. A full day’s work while crammed into the bottom of the boat. 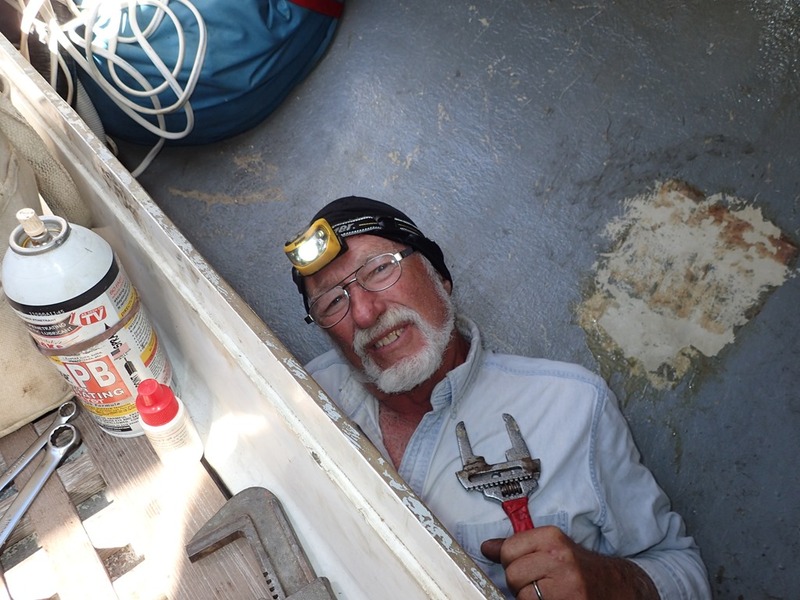 Every once in a while, he would drop a wrench and have to climb out of the cockpit locker and then lie down on the inside of the boat to get at the bilge from a better angle, under the engine. Much colorful language. At least we didn’t have to take off the rudder and pull the prop. Meanwhile I was re-stitching part of the dodger we didn’t re-do in Annapolis – rotten thread. 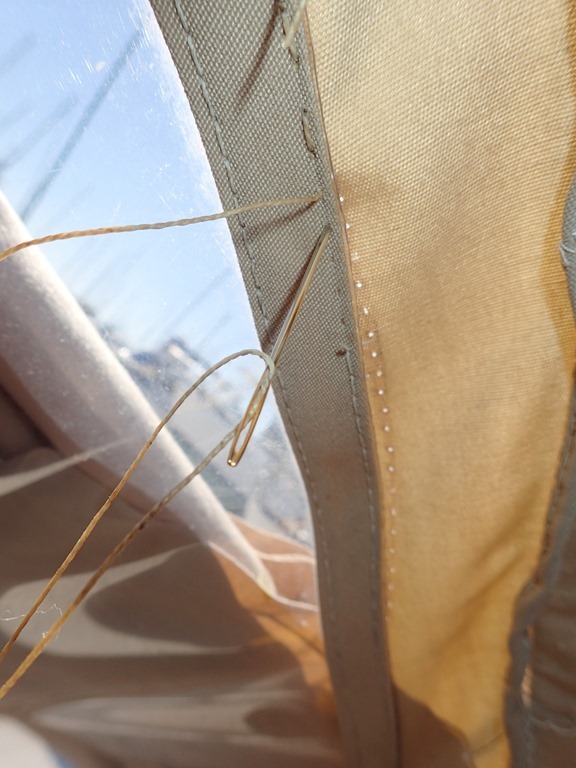 Thread is more susceptible to sun damage than Sunbrella fabric. It also turned out that the zinc anode just aft of the prop was badly corroded (it’s a sacrificial metal that protects the copper in the bronze prop). 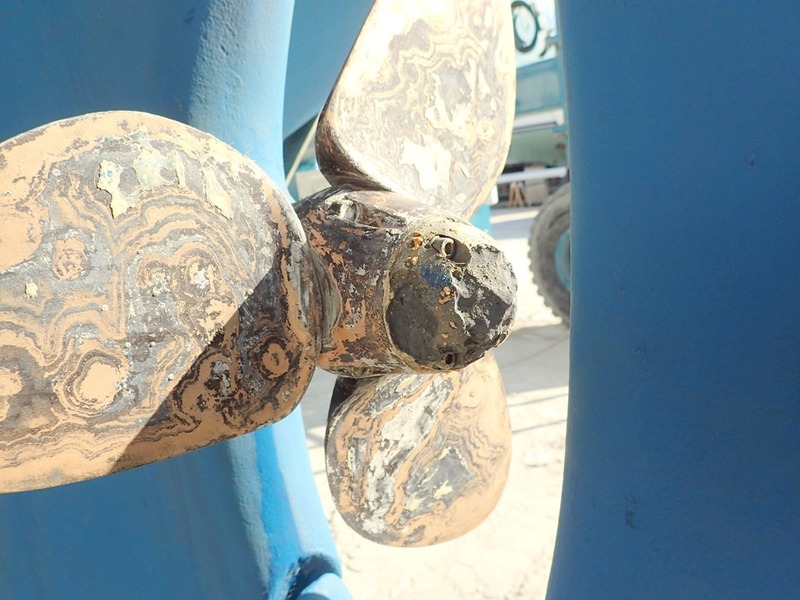 See that black looking thing on the end of the propeller shaft? And it was brand new just about six weeks ago, so maybe Green Cove Springs had some stray electrical current along its docks. Goldwin replaced it and did a bit of work on the prop as well, sanding and then adding anti-fouling. So now we are packing for our flight tomorrow to Hopetown. Taking some dirty clothes because the marina here has no laundry, although it has showers (I use the term VERY loosely – keep your eyes closed, wear flip-flops and don’t touch anything – ugh! And the water smells like rotten eggs.) Oh, and when the train goes by – right next to the marina – the boat literally trembles. Yikes. But she will be safe here by herself until we return. Been there, done that. Hi, I am Steve another Nic 31 owner. I had emailed you some time ago but have not gotten back to you after your response. Goodwin my compliments to you on your work. I took out my stuffing box and replaced it with a PSS dripless shaft seal. I am now convinced that CN hired midgets to work in that area of the boat. 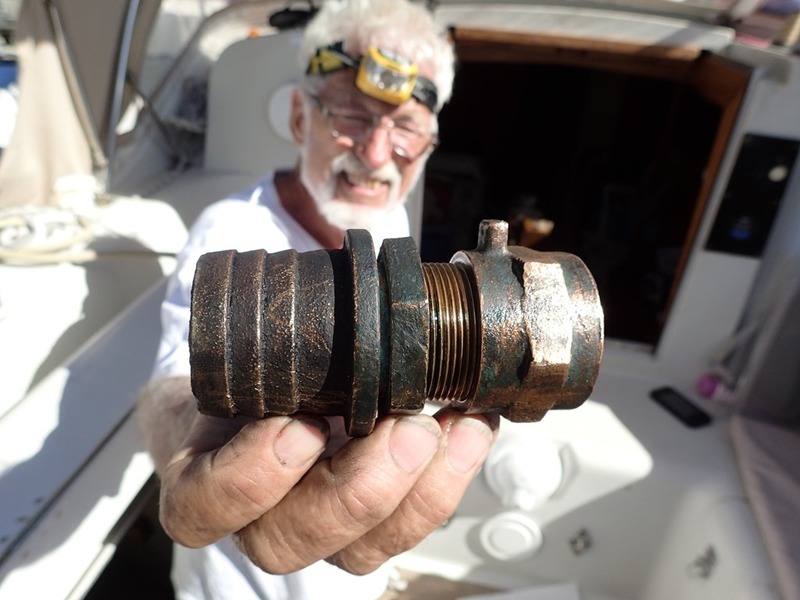 Goodwin did not mention the time and effort it takes to remove and reinstall the flange on the propeller shaft. I am also aware of the time it takes to remove everything from the cockpit locker, something that I have to do to get to the propane locker that is installed in the cockpit locker with 14 wingnuts and bolts to remove to get the cover off. I have enjoyed reading your blog and seeing your boat improvements and your adventures. Keep up the good work and keep the blog going! !